Recommended Name: Dondorf Rhineland pattern. Formerly labelled F-1.75 and XP4 (XP for eXpatriate Paris). In All Cards on the Table (1990), Sylvia Mann calls it "a Dondorf House pattern". This pattern was developed as a house pattern by Dondorf in Frankfurt/M. around 1870. They printed several versions while the firm existed, among them some with pictorial aces. The pattern combines features of other patterns in use in Germany at the time of design. The pattern was later copied by several makers, and its continuing success until today was probably due to the fact that it became very popular in Denmark, Poland, the Netherlands, and some other countries. 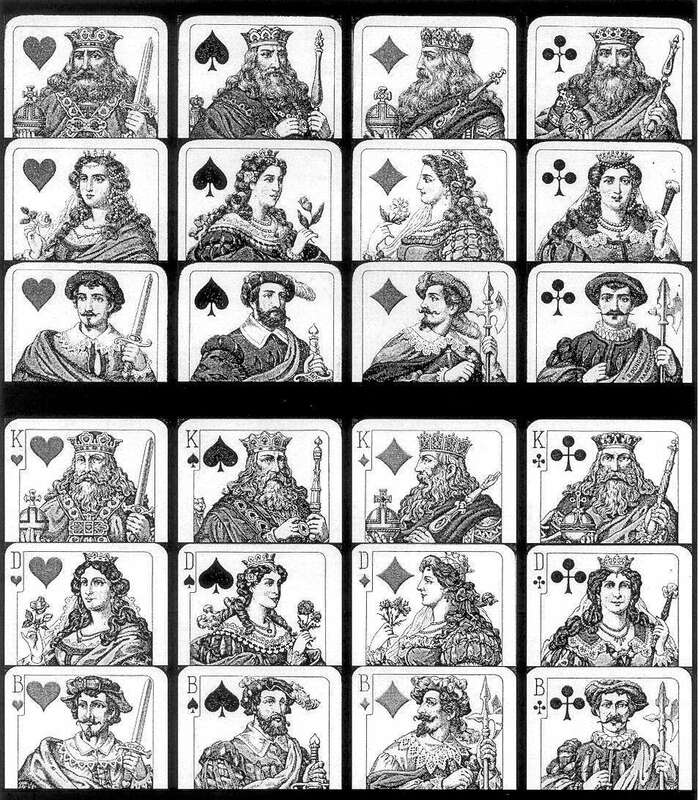 There are variants that have the general appearance of this pattern, made e. g. by Speelkaartenfabriek Nederland and some Belgian makers, but they differ in the attributes of the Kings and Jacks. Those should not be considered as belonging to this standard pattern, but could be described as "variant of the Dondorf Rhineland pattern". K with orb and sceptre is shown in a frontal view, like the other two court cards in this suit. The Queens wear crowns and hold flowers, except Q with a fan. Q is in profile, looking left. J has a halberd in his left, a hilt of a sword in his right, and he is looking back to the left over his shoulder. King, Queen, Jack and numerals. Typical packs have 52 cards, 32 (for Skat), or 40 (for l'Hombre). If they have index signs, they vary depending on the country of origin or use. Top three Rows: Dondorf, Frankfurt, c.1890.